Really all of our homes have mountain views but the vacation rentals listed below are exceptional! These beautiful homes were built in the mountains for a reason, to soak in the great outdoors. Surrounded by breathtaking vistas everywhere you look you won't be disappointed! Beyond the stellar location and views, these homes offer guests plenty of space for groups small and large. Complete with a variety of other amenities and features to make you feel right at home, browse and book online today! 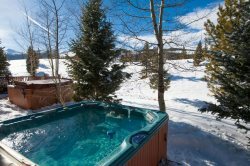 4 Bedroom Home minutes from Keystone Resort! Pet Friendly!